Jennifer Khoshbin’s art can be found across downtown San Antonio. For a time, if you were driving on North Flores Street, one of the main arteries in Alta Vista, you’d see illuminated marquee signs, which displayed messages from local wordsmiths and poets, who collaborated with Khoshbin on the series. In Southtown, at the intersection of Pereida and South Alamo streets, her installation of a public seating area reminds us to “PAUSE” and take in the moment. In Hemisfair’s Yanaguana Garden near The Magic Theatre, a French theatre model-inspired backdrop she created encourages imaginative storytelling. 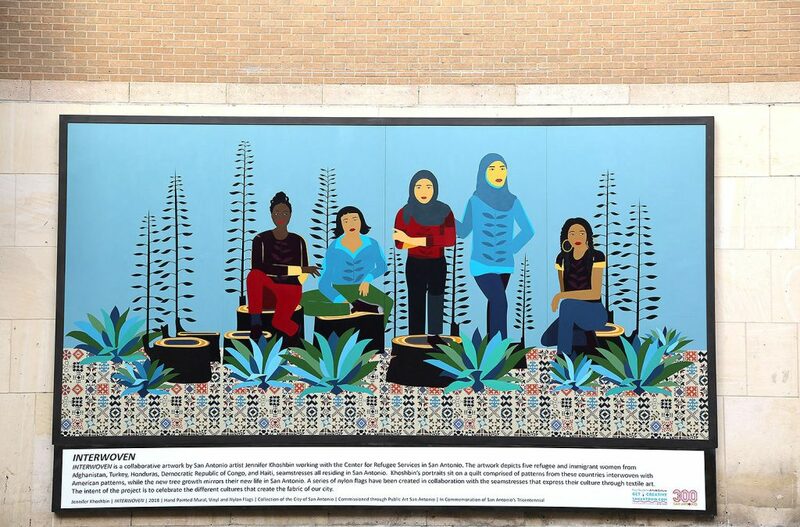 Most recently, Khoshbin completed a mural commissioned by the San Antonio Tricentennial Commission she dubbed “Interwoven” in the heart of downtown at the intersection of East Houston and Navarro streets. 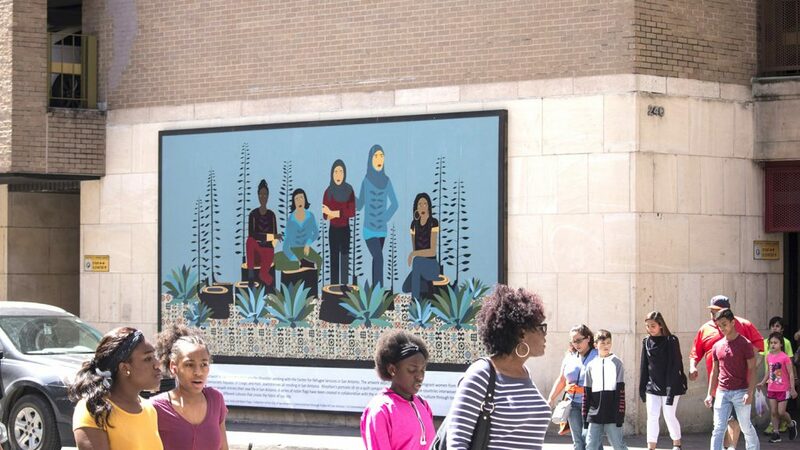 “Interwoven” depicts five refugee and immigrant women who have come to call San Antonio home. The location was perfect to convey a raw and true image of a lesser known San Antonio community at one of the busiest intersections downtown. 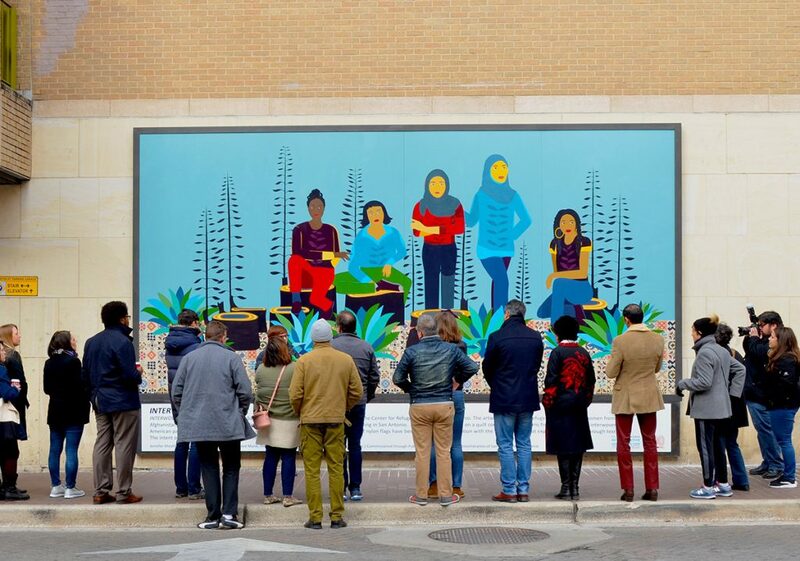 When the commission and the city of San Antonio awarded the grant to Khoshbin, one of 29 local artists and organizations selected to depict the city’s diverse culture, she had just finished a two-year project titled “Word on the Street” at Artpace, that had been a collaborative effort with women in a sewing circle at the Center for Refugee Services on the northwest side and through Refugee and Immigrant Center for Education and Legal Services (RAICES). She wanted to continue her relationship with the women she had met and had them in mind when she was thinking of a subject for the mural. 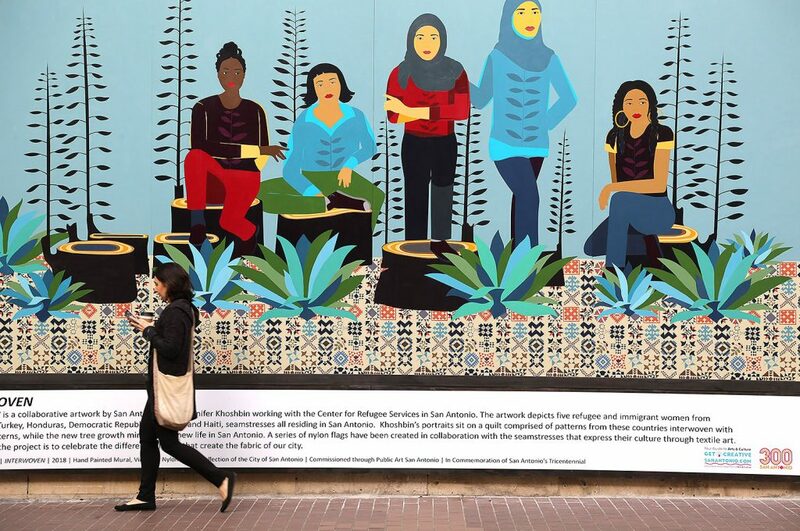 When you first come across the mural, the first thing that draws you in are the many hues of blue—the sea blue of the background; the darker blues of the hijabs two of the women wear, of the jeans of another; the blues and greens of the agave plants—all meant to catch your eye up close and from a distance. Khoshbin’s goal was to invite as many people as possible to view the mural, so she wanted the piece to be bold and exciting. Among the shades of blues are five women seamstresses representing Afghan, Turkey, Honduran, Republic of Congo and Haiti, who Khoshbin grew close to from her time at the refugee center. The portraits do not hold deep detail of facial features and are done in a contemporary pop style because some of the women wanted to remain anonymous. They sit upon and around tree stumps that have new foliage, fresh leaves and twigs that represent new growth and new life. Similar foliage can be found on their attire, hinting at new growth within themselves. Below the group is a colorful quilted pattern inspired by the activity that brought them together, patterns from early American quilts are “interwoven” with traditional patterns from the countries the seamstresses are from. Khoshbin’s relationship with the seamstresses will continue on through a new project: The women are getting together to embroider a series of outdoor nylon flags they plan to hang around the city. Originally from Philadelphia, Khoshbin comes from a highly artistic family—her sister is a new media artist in New York City, her brother is an art curator who lives here and in New York, and her mother is a ceramicist. Khoshbin’s art journey began when she studied Fine Arts and Sociology at the University of Texas, Austin, and the University of Kentucky. Khoshbin’s personal style is focused around intimate literature-based art through different mediums. It wasn’t until the last couple of years that her medium shifted to a broader scale of public work. “Interwoven” will be on display at East Houston and Navarro streets indefinitely. I always admire this work when I walk by. Thank you for telling its story and that of the artist.